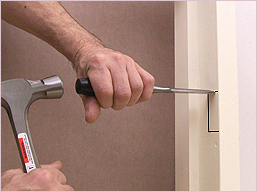 Fitting a rim lock(the "yale" type lock on your front door) is fairly straight forward. The key to success is getting the hole for the cylinder in the right position. If you don't get this precise the lock may not fit properly. 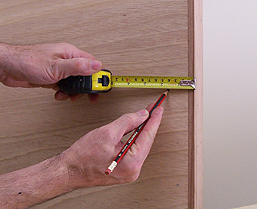 Take care with the marking out and drilling to ensure excellent results. Fitting instructions will vary slightly with different locks. Here is a fairly typical example. Carefully mark the position for the cylinder. 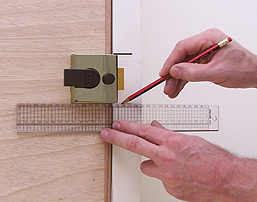 Your lock should come with either a paper template to help achieve accurate positioning, or the instructions will give precise measurements that you need to follow exactly. Pictured right measuring exactly 40mm from the edge of the door. Drill out he hole for the cylinder.The fitting instructions will tell you the size of the flat bit you need for the particular cylinder. (usually 32mm). Make sure you keep the drill level. 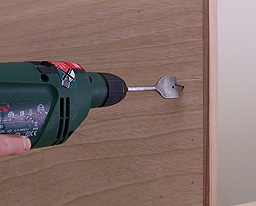 Tip To avoid the wood splitting when the flat bit exits the far side drill from one side first till you see the tip of the flat bit coming out the other side, then complete the hole from the other side. 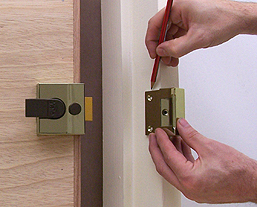 Feed the cylinder through the hole and make sure the connecting bar is the right length for the thickness of your door. If necessary trim it to size. Note the score lines on the bar pictured right. You can snap off the desired amount along one of these lines using some mole grips and pliers, or alternatively saw it with a junior hacksaw. In this case you need 12mm sticking out. Feed the cylinder through the hole from the outside and with the supplied bolts bolt the mounting plate to it. As you tighten the bolts you should be able to position the plate as specified in the instructions. In this case 1.5 mm. from the edge of the door. 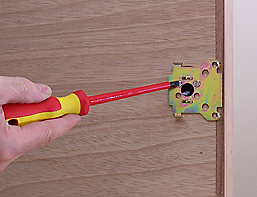 Make sure the bracket is exactly where it should be by temporarily attaching the latch. To do this offer up the latch to the bracket and locate the cylinder's bar into the locating hole on the latch than slide the latch a few mm. backwards. 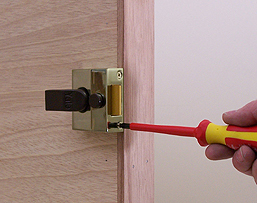 When located the latch should be perfectly level with the edge of the door. If you're happy with the position of the latch you can remove it and screw the bracket firmly in place with the retaining screws supplied. After securing the plate re-attach the latch and secure it with the two small retaining bolts on the side of the latch. Finally fix the strike plate in position. 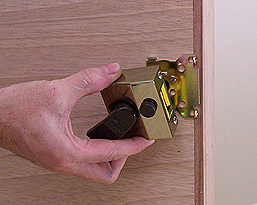 With the door closed and using the latch as your guide mark the position for the strike plate. Make sure it's lined up perfectly. 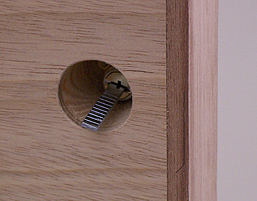 The strike plate needs to be recessed into the door frame. Open the door then mark round the strike place.